Creating an ombre effect on any knit or crocheted wool item is easy using just some basic supplies. 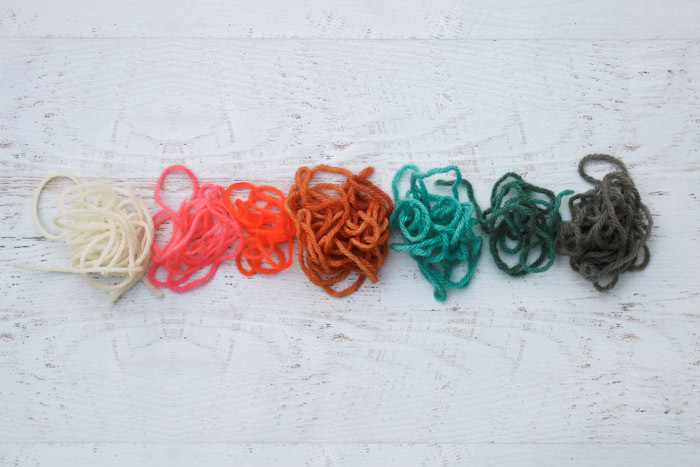 Learn how to dye yarn with food coloring in this fun video tutorial! Can we agree there’s a very fine line separating kitchen and craft supplies? In my house that distinction is just based on which room something was last abandoned in. I love finding new uses for regular, old items laying around the house (like this Dollar Store twine that combined with a leather belt to become a basket! ), so when I whipped up the Morning Mittens recently, I knew they wouldn’t stay white wool for long. I mean, let’s be honest, I’m destined to stain them, so I might as well just do it deliberately. That’s where the idea of dip dying a finished crochet or knit item to create an ombre effect was born. At first I considered using Kool-Aid, but Kool-Aid comes in a narrower range of colors. I liked the idea of having every theoretical color as an option, so I opted for food coloring instead. 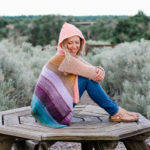 While doing some research on how exactly you dye yarn with food coloring, I came across a few helpful posts, like this one and this one, that outlined how to dye loose wool yarn. 2. I have a lot to learn about color theory. The main colors I used were from a set of neon and a set of primary grocery store liquid food coloring. I also added a drop of black to the navy mittens in attempt to deepen and muddy the shade. I put together a super quick :50 second video tutorial below that shows you the process start to finish. You can find the full written instructions on how to dye yarn with food coloring below the video. As a side note, my 4-year-old LOVED this project. She was dying her own yarn “noodles” right alongside me. 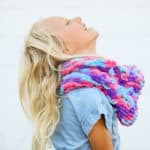 I think it would be so fun to make little beanies, mittens or cowls for the kiddos in your life and then let them choose the colors to create their own personalized dip dye look. Since the water for the dye is extremely hot though, make sure an adult is the one to actually do the dunking into the dye. 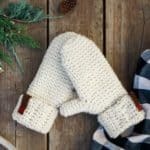 If you’re interested, the free crochet mitten pattern pictured in these photos can be found here. It looks knit–but it’s not! 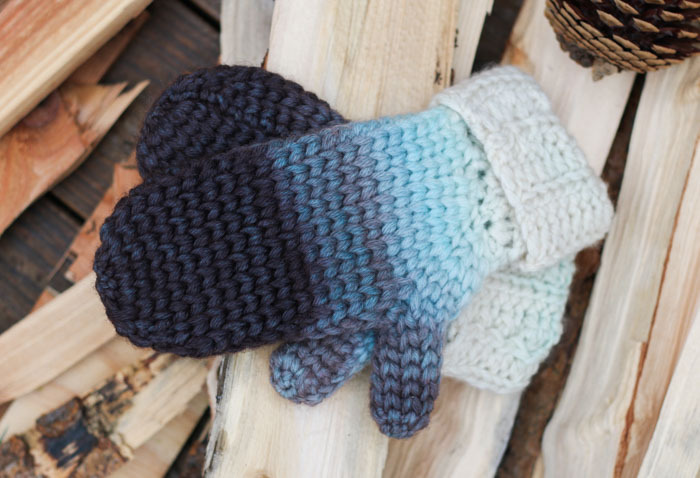 Lion Brand has created a kit with the 100% wool yarn needed to make these mittens, plus a copy of the pattern. You can pick up that kit here. Pin this yarn dying tutorial for later here. So you can spend more time dying and less time shopping, this post contains affiliate links at no extra cost to you. 2. 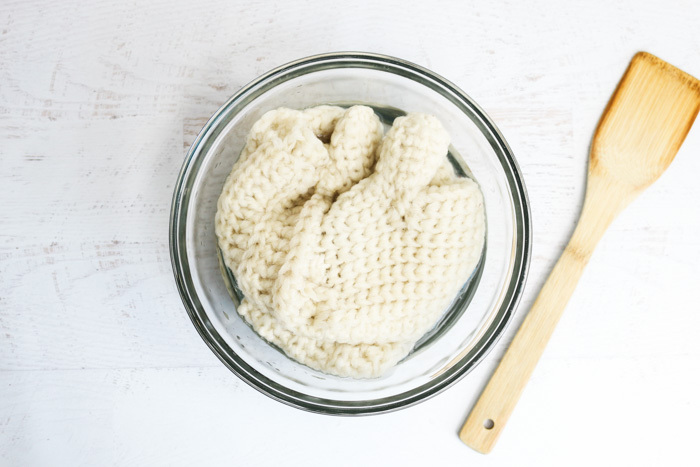 Remove crochet/knit item, gently squeeze out excess water and set aside. 3. In non-aluminum pot, combine one quart water to 1/4 cup vinegar. Depending on the size of your pot and the item you’re dying, you may need more than one quart of water. Add 1/4 cup vinegar for every quart of water. 4. Boil water. Turn off heat. 6. (Optional) Gently insert a chop stick through the crochet/knit item so as to create a way to prop it evenly in the dye bath. See the video for an example of this. 7. 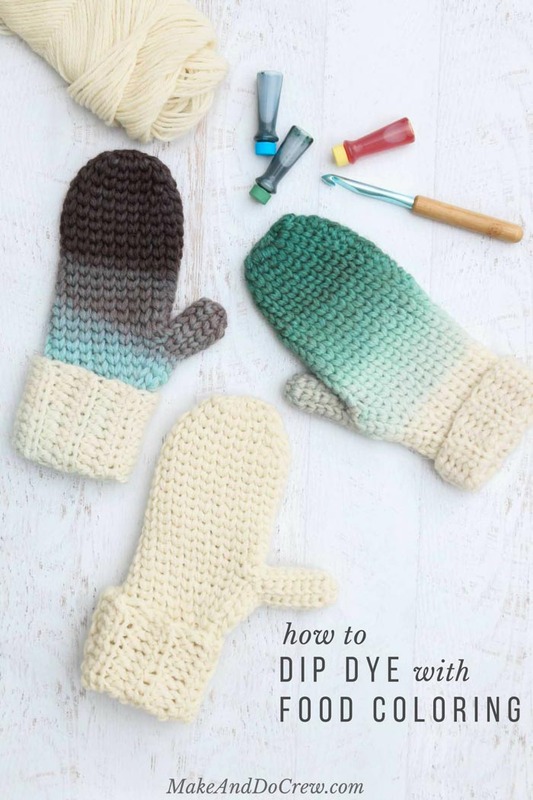 The best part–dip your yarn-y item into the dye bath and behold the magic of food coloring! 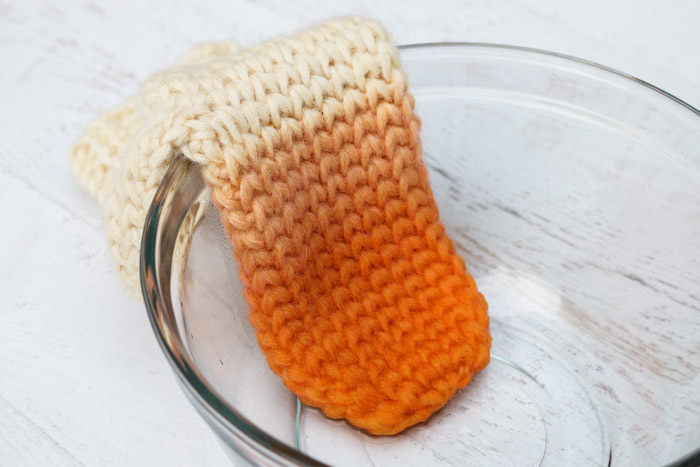 As you can see in the video tutorial, you may choose to just dunk it a few times and be done, or you may let it soak for a long while until the all the dye in the bath has been absorbed by the yarn. 8. 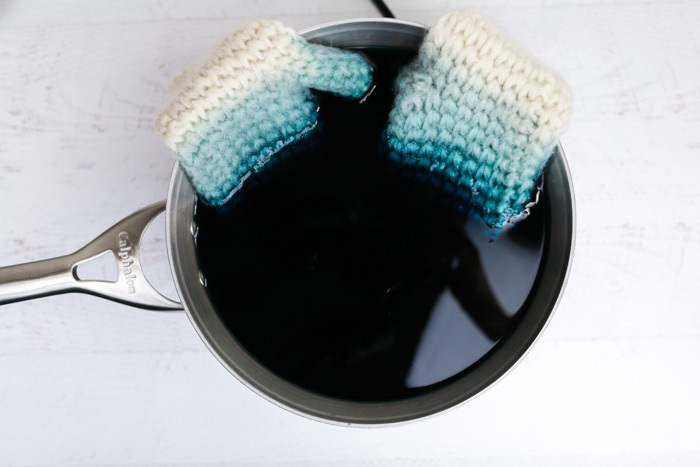 Since wool can felt from the combination of hot water and friction, be careful not to swirl your yarn or crochet/knit item around in the dye like a torpedo. Do check your item frequently until yarn color is a smidge darker than you’d like. Wearing rubber gloves, carefully remove the item and rinse it in cold water–it may still be quite hot. Very little dye will rinse out. 9. Gently lay your item flat and let it air dry. 10. 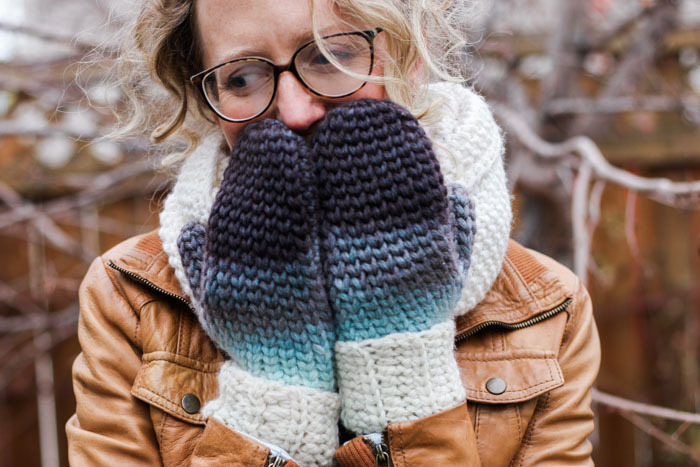 Get started on your next wooly crochet or knit project so you’ll have something new to dye! You can find all my free patterns here. This looks beautiful!! However, I worry that the food coloring dye would spread/transfer if the item got wet again. Do you know anything about that? 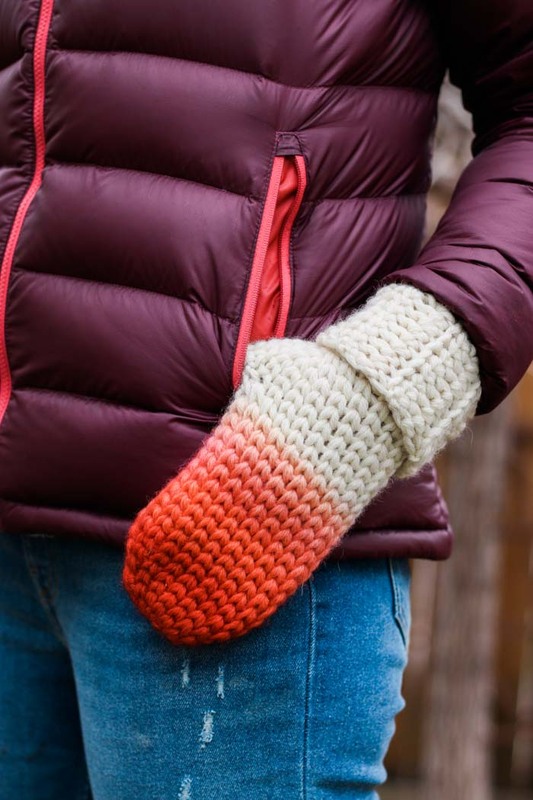 My mittens are destined to get wet in snow, so I’m wondering if I should only try this on items that would never be exposed to liquid. Great tutorial, Jess! I really like playing around with dying yarn *before* I crochet it, and never thought of doing it after! Super clever! Thanks Jennifer! That’s exactly what I thought. It’s a really different effect to dye afterward. Now I kinda want to try it on everything! Haha. I’m almost embarassed to admit this, but it’s from Old Navy. 😂 I got it for Christmas a few years ago and it just goes with everything. Hi. I happen to be allergic to wool. Would this process work with any other kinds of yarn? Thank you for all your wonderful ideas! I love them all! Will this work on any other yarn besides wool? My pleasure! 🙂 I think it should work on any 100% natural fiber yarn (like cotton). You wouldn’t want any acrylic component to the yarn. 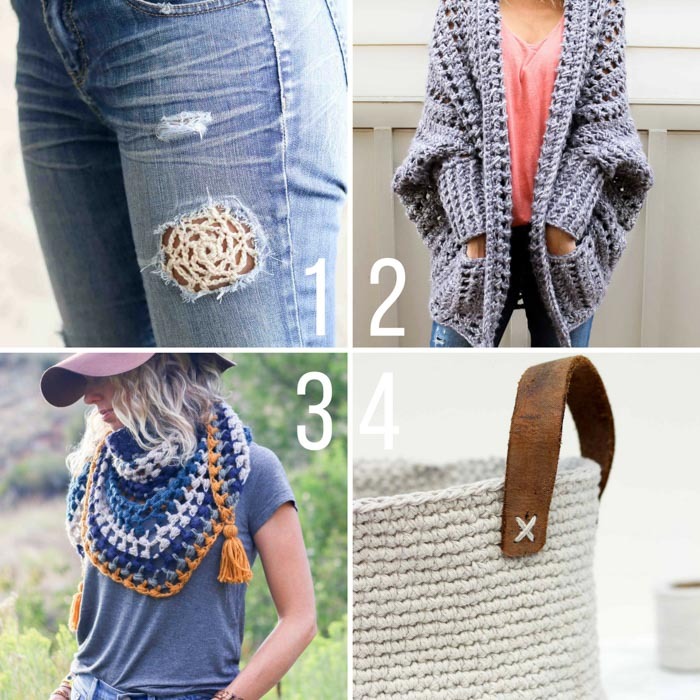 Love all your crochet ideas. I was wondering if you had a pattern for a hat for a newborn? Our hospitals in Cincinnati ask for red knit or crochet hats for newborns in February (heart and Valentine Month) and the one that I used last year is kind of boring although I did manage to put a little border on it. Wonder if you have a more stylish design. You are never to young for style!! Thanks for any help you could give me. I thought I might get started a little early with this project if you have a suggestion or pattern. Keep up the wonderful emails. These are stunning! Love the pop of color. Thank you, Ashlyn! I do too! Does the dye transfer to anything when you wear them? I just want to be sure! Thanks for your help! Nope, it’ shouldn’t! 🙂 The vinegar sets it. Even the very first rinse out of the dye bath is amazingly clear.